‘Tis the season for – shedding! It works equally well on dogs. Be prepared for this to make a big mess, so if you can, use it outdoors (or plan to vacuum after you finish). It’s going to reduce shedding considerably, especially this time of year. An added benefit for cats is that it virtually eliminates hairballs. I found some of the best prices on the Furminator here. For videos on the Furminator in action on dogs and cats, click here. Amber loves to be furminated! I spent yesterday at a spiritual retreat center in the foothills of the Blue Ridge Mountains. It reminded me of the value of getting away from it all, even if only for a day. The drive towards the mountains in the early morning was beautiful, and the day spent in the company of like-minded people with plenty of opportunity for quiet reflection fed my spirit. The topic of the retreat was making conscious choices – something that is an integral part of conscious living. How do you live your life? Do you make choices that limit you, or choices that allow you to expand? Make the choice to say “yes” to yourself today. Do you wish you could get away from your busy life even just for a day? Give yourself the gift of a retreat. Retreats come in many shapes or forms, the main idea is that it gets you away from your usual routine and allows you to do something that nourishes your spirit. But as much as I enjoyed my day away from it all, I was happy to come home to Amber at the end of the day. Pets nourish our spirit every day. I grew up being a worrier. I could easily come up with the worst possible scenario for any given situation, and then turn it over and over in my mind endlessly, to the point where I would often let myself get paralyzed with worry. I knew that this propensity to worry was holding me back from letting myself live my life to its fullest potential. When I began to understand and really believe that we have the power to control our thoughts, and that our thoughts are vibrations that affect what we experience in our reality, I was able to short-circuit the worry cycle more easily. It became clear to me that worrying and obsessing over what might happen would only attract the very thing I did not want into my experience. Worrying also made a statement that I didn’t trust in the wisdom of the universe, and I truly believe that Source wants me to be happy. I know on a deep level that things will always work out. All is well. We all have the power to choose our thoughts. We can make a conscious choice that we want to feel good. Once you make this commitment to yourself, it becomes easier to redirect your thoughts from worrying about the future and to focusing on the present moment instead. Worrying simply feels too bad for you to keep doing it. Animals remind us of this every day. They live fully in each moment and give all their attention to what is happening in that moment with no thoughts towards the future. Start today. Make the commitment that just for today, you will not worry. You might just get addicted to that worry-free way of being! Remember the old Simon and Garfunkel Song (The 59th Street Bridge Song)? Do you move too fast through your days, or do you take the time to kick the cobble stones and feel groovy? When I rush through my days without being fully present in each moment, I feel like time has passed me by. I don’t feel like I’ve accomplished anything, and at the end of the day, I just feel exhausted. It’s easy to get caught up in this mode of being – we all have to do lists that are a mile long, and demands on our time are coming at us from all directions. When days are that full, it becomes even more important to slow down and remind ourselves to stay in the moment. Animals are masters at this. That’s what they do – they live in each moment. Need some help to remind you to slow down? Take a break. Take a few moments to pet your cat or dog. It will slow you down and remind you that life is not to be rushed through, but to be savored. Slow down today. You may just end up feeling groovy! Meditation is usually viewed as a spiritual practice, but research shows that there are innumerable health benefits as well. Most physical illness is caused by stress, and meditation provides stress relief by calming down the mind and body. A regular meditation practice is one of the best things you can do for your mind and body. You don’t have to. Simply making the commitment to sit quietly for fifteen, ten, even five minutes a day can have beneficial effects. Don’t judge yourself – if you find that you can’t quiet your mind, try and simply acknowledge your thoughts, and then gently let them go. Your pets can help you meditate. If you can’t clear your mind, try focusing on the purring cat in your lap or the sleeping dog by your side. Focus on the love you share with your pet. While this may not be what some purists consider meditation, I can guarantee you that it will change your state of mind to one of peace and relaxation. There is an unseen energy that exists in and around every living thing. Some people call it God. It has nothing to do with a particular religion. Maybe you’re more comfortable with calling it Spirit, Universal Flow, All That Is. My preferred term is Source. We are always connected to Source, but sometimes, we forget. It’s like our conscious awareness of this connection has temporarily slipped away. How do you know when you’re consciously connected and when you’re not? Your emotions are your guide. When you feel fear, doubt, worry, lack, scarcity, or even hate, you’re disconnected. When you feel love, joy and happiness, you’re connected. The ebb and flow of that feeling of connection is part of our journey and evolution. So how do you maintain this connection consciously and at increasingly deeper levels? Looking deep into the eyes of my cat. Spending time with a good friend. Listening to a piece of wonderful music. Reflecting on the blessings in my life. Curling up with my cat and a good book. Identify your moments of connection, and consciously guide yourself back into connection when you feel it slipping away. Sometimes, even the memory of one of your “connection moments” can bring you back into alignment. Animals are masters at maintaining their connection with Source. They live in the moment – one of the best and easiest ways to stay connected. As you can see from my own connection moments list, Amber plays a big part in helping me experience my connection with Source. Let your pets help you find your connection. It’s impossible to feel disconnected when you pet, play with or simply watch your pets. I’ve been a fan of ER since the very beginning and have not missed a single episode in its 15-year-run. Over the past few seasons, it’s been getting harder for me to hang in with it. While the show has always been filled with drama, disaster and negativity, some of the more recent storylines have taken this trend to new heights and they almost lost me when they started dropping helicopters on top of favorite characters. Even though I generally stay away from tv shows and movies that contain violence, tragedy and disaster, I’ve always loved medical shows, and I guess that’s why I’m hanging in with this one through its final season. I was pleasantly surprised with this week’s episode. Yes, of course it was great that George Clooney returned to the show – who doesn’t like to watch George Clooney. But what was really different was that this was a mostly happy episode! Most of the storylines were happy – there were reunions with old friends, and lives were saved instead of lost. And in the final scene, George Clooney and Juliana Margulies were clearly happy together. Apparently, even dramas can have happy endings. Be discerning about what you watch on tv. If you continually watch shows that depict violence, tragedy and drama, you may find that these lower vibrations are reflected in your real life. If it doesn’t feel good to watch something, don’t watch it just to pass time. Find another channel, or turn the tv off and do something else. You’ll feel better and lighter. A word about pets and television: some people leave the tv on to keep their pets company while they’re gone during the day. Animal Planet in particular is a favorite channel for this. I have nothing against Animal Planet, it’s a great cable channel. But while it may be fun to watch for you, you might not want your cat or dog to be exposed to images of animals being hurt and taken to the ER if they happen to watch during one of those programs. In addition, the constant parade of other animals across the screen might be upsetting rather than calming to your pets. A better way to keep your pets entertained and calm is to play soft music while you’re gone. This video is worth two minutes of your time. It really is a wonderful world – let the animals show you. The single most effective step you can take towards better mental, emotional, spiritual and physical health is to stop watching the news. You are discerning about what you put into your body – why not use that same judgment about what you allow to enter into your mind? All the bad news and stories of gloom and doom are not an accurate reflection of what goes on in the world. Despite the distorted view we’re being offered by the media, there are far more good things happening in the world every day than bad things. Why do you allow yourself to be bombarded with a constant barrage of negativity when you have the choice to push the off button? Negative emotions such as stress, worry, fear and depression are vibrations that affect what you attract into your life. If all you’re seeing and hearing is negative, don’t be surprised if that’s what you see reflected in your daily life, and in the status of your health. Try it for one day. Don’t watch any news, don’t read a paper, don’t listen to news radio, don’t scour the internet for news stories. You will be surprised how much better and lighter you will feel. Amber doesn’t watch the news. I just watched Friday night’s 20/20 special about Siegfried and Roy’s final performance, and it touched me deeply. I have always been in awe of the connection Roy shared with animals all his life, and his words “don’t shoot the tiger” after he was so gravely injured five years ago to me were the ultimate testament to his love for these beautiful animals. I was fortunate to meet Siegfried and Roy at a book signing in 1992. They brought one of the big tigers and a litter of five tiger cubs to the bookstore with them. I got to pet one of the cubs. They were very gracious to every single person in the long line waiting to get their books signed, and they signed my book “To Ingrid. Love, Siegfried and Roy”. What I remember most about that day, though, was the incongruent sight of this huge, magnificent white tiger in the middle of a bookstore. In 1993, I got to see their show at the Mirage in Las Vegas from front row seats. It was truly a magical experience. Siegfried and Roy have always been about magic, about mastering the impossible, about dreaming big and and making those big dreams come true. This final performance was a triumph of their determination and the fierce belief that Roy would not only survive, but recover from his injuries. They are living proof that thoughts fueled by belief create reality. We’re getting a taste of spring here today – sunny and feels like it’s in the mid-70s if not warmer! All the windows are open and Amber is enjoying the spring breeze wafting in through the screens. I spent some time outside cleaning up the deck, and while I was at it, I cleaned the house. I no longer use cleaning products that contain chemical ingredients. I don’t care to have those ingredients around for my own health, but I especially don’t want them around for Amber. 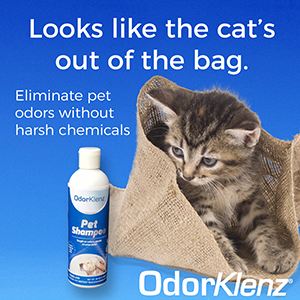 Many ingredients in household cleaners contain hazardous ingredients that are toxic to pets. Cats are especially susceptible because of the way they lick themselves when they’re grooming. In the process, they ingest anything that has come in contact with their fur or paws. Amber hates it when I clean the house. She hides in the downstairs bathroom when I run the vacuum cleaner, aka “The Monster”.